Why Wallet Box is Absolutely Important for Leather Wallets? Leather wallets are expensive and premium product and is mostly used by men. These wallets are made out of raw and top quality leather for long term usage. These Purse are made with great care because they get in heavy contact with jeans and tough clothing while they are in the pocket. 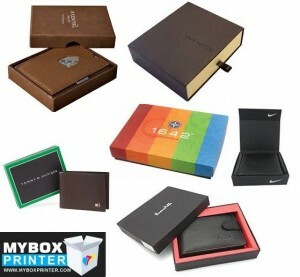 Wallet Box is such an important item for the sales of this premium product. Wallet packaging is designed in a way that it appreciate leather material wallets in a great way and boost the sales. Wallet boxes are available in many sizes but the standard size is 4″x4.5″x1″ and it can hold a wallet of 4″x4″ size. Wallets are made out of 100% leather or other material as well. Mostly ladies present wallets as a gift to their loved men. This product is widely used as a gift and cannot be presented without a proper packaging. Wallet box is used as a gift box for purse. There are many types of these gift boxes. Two piece style is one of the most widely used and successful packaging for wallets as these are easy to use and can be decorated with great details. These two pieces comes in both folding box style and pre-assembled style made out of thick chipboard material. The usage of these depends on the cost of packaging. 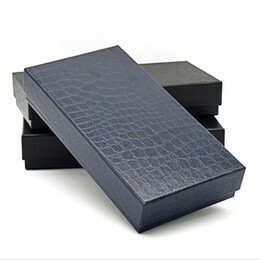 Some of the fine 100% pure leather made wallets are packaged in very high quality gift boxes with lots of custom work. These boxes are quite expensive and gives a very good expensive & decent look to the wallets. These boxes are usually made out of very expensive foil or textured paper with leather like material. Some of the cardboard material used for these boxes have crocodile textured in it which gives a beautiful effect to these packaging. Again, wallet packaging is the face of the leather wallets and should be designed and produced with great care. Leather like textured stocks should be selected for the production of these boxes as these kind of stocks are the best suite for genuine leather wallets and help the produce set a proper price for these gift items. We have many leather like textured stocks available for these leather wallet boxes and are quite cost effective. We can print or foil on these expensive looking materials with great details.